Simple Sound Processor presented here is an ultra-simple circuit module suitable for almost all basic electronics and microcontroller projects. For example, this module can be used as a front-end in an electronics project to detect and process ambient sound in an efficient manner. Even less-experienced hobbyists will find the construction of the circuit on a general purpose printed circuit board a fairly easy affair, since there is no perplexed wiring and all components are housed on the board. As the circuit has no critical adjustment points it is immediately ready for real-world applications. The acoustic sensor in the circuit is a standard omni-directional foil electret microphone (MIC). Sound signals picked up by this microphone is processed by two BC547B transistors (T1 and T2). Pre-processed signals from this section is linked to the monoshot brick realized using the popular NE555N chip (IC1). The whole module can be powered from any standard 5 volt dc supply. Pins 1 and 2 of the 3-pin JST connector (J1) denotes VCC (+5V) and GND (0V) connections respectively, while the final 3rd pin works as the digital signal output (DO) pin. 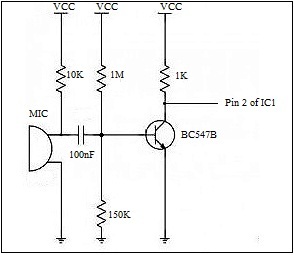 Working of the sound processor circuit is very simple and straight forward. The circuit captures incoming sound signals through the microphone. When the circuit detects a sound activity it generates a digital/logic-level (active-low state) output for a pre- settled duration fixed by the 10K pot (P1). This output can be given to almost all micro controllers for further processing. Although this little circuit module is not intelligent to separate different sounds, it is very useful in making general/microcontroller/robotic projects integrated with sound activation features. As an example, consider the possibility of building a security camera system which takes pictures only when triggered by an audible acoustic wave frequency. Prototype tested with both front-end circuits, but a drop-off in sound detection sensitivity was noticed with the second option!